Models that simulate environmental processes by quantifying fluxes and states vary largely in their complexity and number of parameters. Most models suffer from over-parameterization, meaning that the available information does not allow identification of all model parameters. Over-parameterization is a serious problem in environmental modeling, as it might imply that a model works well, but could do so for the wrong reasons. This can lead to unreliable results when the model is used to make predictions. Model testing, or model validation, is therefore crucial. 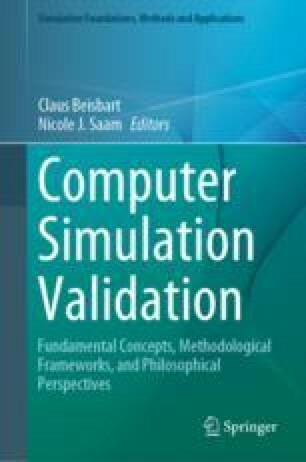 Usually, in more complex models more, internal variables are explicitly simulated, and, thus, there are more opportunities for model testing against observations than is the case for simple models. Increasing model complexity, however, comes at the cost of more parameters, and therefore the risk for over-parameterization increases as well. In this chapter, we discuss different ways to validate models, which simulate hydrological processes at the catchment scale, and the balance between model testability and over-parameterization. A catchment is the area that contributes to streamflow at a certain point and is usually determined based on the surface topography (Fig. 33.4). Precipitation can fall as snow or rainfall. A fraction of the precipitation is intercepted by the vegetation and evaporates from the leaves or needles without ever reaching the soil surface. While rainwater that is not intercepted by the vegetation infiltrates directly into the soil, snow can accumulate on the surface until it melts, resulting in a significant time lag between snowfall and infiltration. 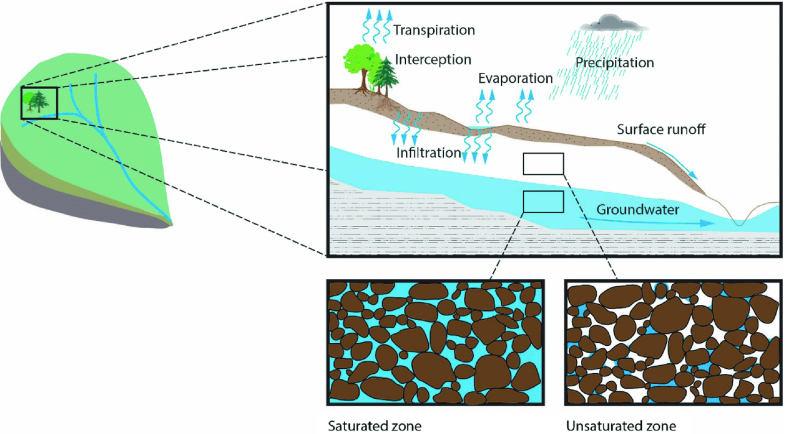 If the soils are saturated, i.e., the pores between the soil particles are completely filled with water, or if the precipitation intensity is higher than the infiltration capacity, part of the rain or meltwater does not infiltrate but flows over the soil surface to the stream as surface runoff. The infiltrated water is stored in the soil as soil moisture storage or percolates through the soil to the groundwater. Groundwater eventually flows to the stream and becomes streamflow, but flow times for groundwater can vary largely. Some of the water stored in the soil (and groundwater) is taken up by plants and transpired. To describe the sum of all forms of evaporation (from the canopy and soil surface) and transpiration, the term evapotranspiration is used. In the unsaturated zone, the soil pores are not completely filled with water but partly filled with air; water is held in the pores by capillary and adhesive forces. The amount of water that a soil can hold against gravity, also called the field capacity, depends largely on the size distribution of the pores. In a sand soil with large pores, only little water can be held against gravity, whereas field capacity is much higher in loamy or silty soils with smaller pores. However, plants can only extract water that is held not too tightly in the soil. The so-called wilting point describes the amount of water in the soil that cannot be extracted by the plants. The soil moisture retention (pF) curve describes the amount of water in the soil and how strongly it is held back (matric potential). Flow velocities and water fluxes in the subsurface can be computed based on the hydraulic conductivity and pressure gradients (Darcy and Darcy-Richardson equation). The hydraulic conductivity describes how quickly water can flow through the soil and is highly dependent on the moisture content of the soil. Water flows faster through large pores than small pores. Therefore, a large portion of the water may flow through macropores (i.e., large pores or macropores such as cracks, old roots, or animal burrows), particularly when the soil is wet and these macro pores are filled with water. Over longer time periods (i.e., at least one year), the inputs and outputs are balanced so that the sum of streamflow and evapotranspiration are equal to the precipitation. If shorter periods are considered, storage changes must be considered in the water balance. The storage term includes all water that is stored in snow and ice, soil- or groundwater and lakes. The changes in storage are important as streamflow responses to rainfall and snowmelt are largely dependent on the storage conditions. Hydrological models simulate how precipitation eventually leaves the catchment as streamflow, including the above-described processes in more or less detail. While there are different types of hydrological models as discussed in Sect. 33.2.2, all catchment-scale hydrological models include one or several differential equations to describe the relation between storage and streamflow. Camporese, M., Paniconi, C., Putti, M., & Orlandini, S. (2010). Surface-subsurface flow modeling with path-based runoff routing, boundary condition-based coupling, and assimilation of multisource observation data. Water Resources Research, 46(2). https://doi.org/10.1029/2008wr007536. Fenicia, F., McDonnell, J. J., & Savenije, H. H. G. (2008). Learning from model improvement: On the contribution of complementary data to process understanding. Water Resources Research, 44 (December 2007), 1–13. https://doi.org/10.1029/2007wr006386. Ivanov, V. Y., Vivoni, E. R., Bras, R. L., & Entekhabi, D. (2004). Catchment hydrologic response with a fully distributed triangulated irregular network model. Water Resources Research, 40(11). https://doi.org/10.1029/2004wr003218. Jones, J. P., Sudicky, E. A., Brookfield, A. E., & Park, Y. -J. (2006). An assessment of the tracer-based approach to quantifying groundwater contributions to streamflow. Water Resources Research, 42(2). https://doi.org/10.1029/2005wr004130. Jones, J. P., Sudicky, E. A., & McLaren, R. G. (2008). Application of a fully-integrated surface-subsurface flow model at the watershed-scale: A case study. Water Resources Research, 44(3). https://doi.org/10.1029/2006wr005603. Kirchner, J. W. (2006b). Getting the right answers for the right reasons: Linking measurements, analyses, and models to advance the science of hydrology. Water Resources Research, 42(3), W03S04 https://doi.org/10.1029/2005wr004362. Laudan, L. (1990). Demystifying underdetermination. In C. W. Savage (Ed. ), Scientific theories. Minnesota studies in the philosophy of science (pp. 267–297). Minneapolis: University of Minnesota Press. https://doi.org/10.1080/03634528709378635. Mirus, B. B., Ebel, B. A., Heppner, C. S., Loague, K. (2011). Assessing the detail needed to capture rainfall-runoff dynamics with physics-based hydrologic response simulation. Water Resources Research 47(3). https://doi.org/10.1029/2010wr009906. Smerdon, B. D., Mendoza, C. A., & Devito, K. J. (2007). Simulations of fully coupled lake-groundwater exchange in a subhumid climate with an integrated hydrologic model. Water Resources Research, 43(1). https://doi.org/10.1029/2006wr005137.